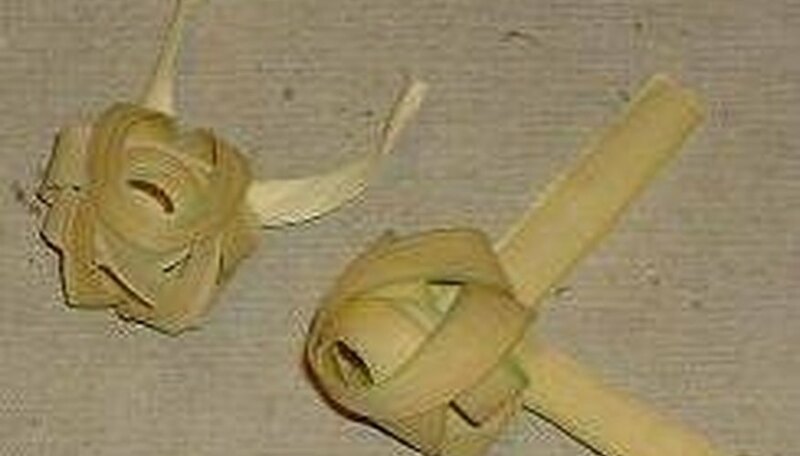 Palm roses are one type of craft made out of palm leaves for Palm Sunday. Palm Sunday is a Christian holiday that falls on the Sunday before Easter, marking Jesus's arrival in Jerusalem. Followers laid palms on the ground in front of him, which is why palm plays a central role in the holiday and its decorations. Take two pieces of palm and meet two ends together, creating a 90-degree angle, or L shape. Lay the vertical palm on top of the horizontal palm, leaving some of the horizontal palm sticking out to the left of the vertical palm. Fold over the excess horizontal palm that is to the left of the vertical palm, so it is folded onto the vertical palm. Secure the corner of the palm. Lay the vertical palm behind the horizontal palm, then lay the horizontal palm in front of the vertical palm. Next, reverse these steps: lay the vertical palm in front of the horizontal palm, and the horizontal palm behind the vertical palm. Fold the vertical palm behind the horizontal palm, and slide the horizontal palm under the vertical palm when you lay it in front. The palm pieces should be in the same position as when you started: like an L shape, only with a reinforced corner. This is the core of the rosebud. Loop the horizontal palm through the knot you formed in Steps 3 and 4, and pull half the length of the palm through the knot, forming one half of a bow. Then loop around and pull the other end back through the knot, so you have an even bow. Do the same with the vertical palm, pulling half of it through the knot and forming a top loop, then pulling the half back through the knot to form the second loop. Stuff the right loop into the left loop. Loop the top loop over the right and left loop, then take the bottom loop and pull it over all three loops.